Hexagloves came out of pure playing… what happens if you do this or that or this. And suddenly the hexagon clicked and the Hexagloves where made. 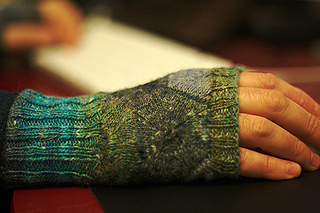 The long colour repeat of the Noro yarn make the hexagons appear separate and distinctively on the mitts. 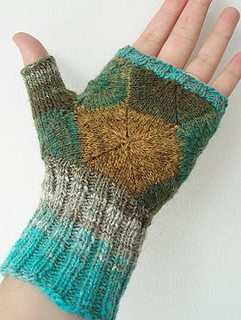 The mittens are made in modules by first knitting a couple of separate hexagons and then picking up along these and joining them by further hexagons and “half” hexagons. Finally the thumb is knitted, and ribbing for the cuff and the top edge are the finishing touches.